TORONTO - North American stock markets tumbled Tuesday as relief over the rise of the U.S. debt ceiling was countered by rising worries that economic weakness seen in the first half of the year was not just temporary. 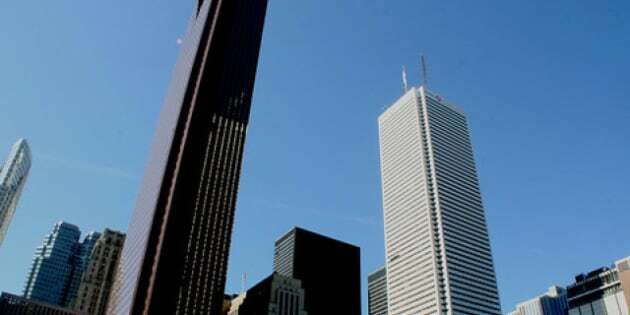 The S&P/TSX composite index fell 193.31 points to 12,752.32 while the TSX Venture Exchange slipped 0.25 of a point to 1,978.85. The TSX has fallen for five of the last six sessions, losing 742 points or 5.5 per cent. New York markets also fell heavily, with the Dow Jones industrial average plunging 265.87 points to 11,866.62, its eighth straight decline. The Nasdaq composite index lost 75.37 points to 2,669.24 while the S&P 500 index was down 32.89 points to 1,254.05. The Canadian dollar closed lower Tuesday as the greenback rallied in the wake of the agreement to raise the U.S. debt ceiling, losing of a cent to 104.14 cents US. Canadian investors who returned to trading following a TSX closure for the August long weekend faced U.S. data released Monday that showed the manufacturing sector slowed to within a whisker of slipping back into contraction. The Institute for Supply Management's index on the sector fell to 50.9 during July from 55.3 the previous month. "It might be a bit bigger than a soft patch," said Chris Kuflik, wealth adviser at ScotiaMcLeod in Montreal, adding that worry over government debt crises in Europe and the U.S. has also persuaded investors to stay sidelined. "The talk around the world has been centred around debt crisis. And what it's done is led to some paralysis as far as people who are willing and able to invest money in businesses. They're hunkering down because of all the uncertainty." In another troubling sign for the American economy, another report Tuesday showed that Americans cut back on their spending in June for the first time in nearly two years and their incomes grew by the smallest amount in nine months. The U.S. Commerce Department said consumer spending dropped 0.2 per cent in June while incomes rose 0.1 per cent. It was the weakest growth in income since September, reflecting anaemic hiring this spring. The data were particularly bad coming before the release Friday of the U.S. non-farm payrolls report. Job creation hopes were already muted before the ISM report with economists expecting the American economy cranked out about 90,000 jobs during July. "The market is starting to wonder where the growth is going to come from," said Nick Kalivas, a vice-president of financial research at MF Global in New York. "It hasn't hit the panic button yet, but that's where we're drifting." Meanwhile, the U.S. Senate passed a bill to raise the debt ceiling and avert a potentially catastrophic default. The House approved the bill Monday but there are still worries that American debt could face a downgrade. Planned cuts in U.S. government spending were already being felt on stock markets. Extendicare Real Estate Investment Trust units tumbled $1.90 or 18.66 per cent to $8.28. It said Monday that cuts to Medicaid payments for seniors' care in the United States will have a "significant and immediate" impact. Investors also kept a wary eye on the European government debt crisis as Italian and Spanish markets were slammed by investor worries that an economic slowdown will hurt their chances of dodging Europe's spreading debt crisis. The yield for the Spanish 10-year bond rose to 6.45 per cent, the highest since the euro was created, before easing back slightly to 6.39 per cent by midday. And Italy's equivalent yield jumped to 6.18 per cent, above where it was before July 21. Losses were spread across all sectors save gold with the TSX financials sector down 2.21 per cent with Royal Bank down $1.11 to $50.29 while CIBC fell $1.79 to $71.19. The tech sector also weighed, down 4.16 per cent with Research In Motion Ltd. (TSX:RIM) down 70 cents to $23.23. Oil prices were lower for a third session on demand worries as the September contract on the New York Mercantile Exchange lost $1.10 to US$93.79 a barrel. The energy sector slid 2.28 per cent as Canadian Natural Resources gave back $1.47 to C$37.11 while Suncor Energy was down $1.34 to $35.28. Metal prices drifted lower with copper down two cents at $4.39 a pound, while the base metals sector moved down 4.34 per cent. The ISM report pushed the metal down seven cents Monday, despite other data showing a better than expected Chinese Purchasing Managers report for July. Teck Resources lost $2.41 to C$44.93 and First Quantum (TSX:FM) slipped $10.73 to $121.73. The company said Tuesday that its shareholders have approved a plan by the Vancouver miner to split its shares five for one, effective Aug. 11. Industrial stocks were also lower as Canadian National Railways dropped $1.95 to $69.69 while Bombardier Inc. lost 24 cents to $5.54. The gold index was the sole advancer as nervous investors continued to push gold higher with bullion up $22.80 to a fresh record high close of US$1,641.40 an ounce. Goldcorp Inc. (TSX:G) advanced 76 cents to C$46.45 and Barrick Gold Corp. climbed $1.10 to $46.65. On the earnings front, shares in food company Saputo Inc. declined $2.70 or six per cent to $42.05 after the Montreal-based company reported that first quarter profits rose 13.3 per cent to $126.6 million from $111.7 million a year ago. Revenue increased 14.1 per cent to $1.64 billion. Molson Coors Brewing Co. said Tuesday that its profit fell six per cent to US$222.8 million in the second quarter, as increased prices and cost cuts were mostly offset by lower sales volumes and higher commodities costs. Its shares were down 32 cents to US$44.31 in New York. Canada's largest trucking company, TransForce Inc., reported second-quarter profits of $26.2 million, helped by revenues from its recent acquisitions. Revenue was up 31 per cent to $650.8 million and its shares lost 26 cents to $13.76.